Waveplates are made from materials which exhibit birefringence. The velocities of the extraordinary and ordinary rays through the birefringent material varies inversely with their refractive indices. Difference in velocities gives rise to a phase difference when two beams recombine. At any specific wavelength the phase difference is governed by the thickness of the retarder - waveplate. Dual wavelength low order waveplates are made from high quality crystalline quartz and are available at quarter-wave, half-wave and full-wave retardance. One of possible examples is a waveplate, which is designed to be used in dual wavelength setup at 800 nm and 400 nm. It operate as a λ/2 plate at 800 nm and λ plate at 400 nm. This means that 45° rotation of waveplate, induces 90° rotation of electrical vector at 800 nm and does not change state of polarization at 400 nm. Another possible configuration is λ/2 plate at 800 nm and λ/4 plate at 400 nm. In this case waveplate rotates electrical vector by 90° at 800 nm and provides a circular polarization at 400 nm. These are just two possible configurations out of many available. 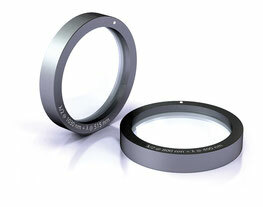 All waveplates are mounted in Ø25,4 mm black anodized aluminum ring and feature clear aperture of 18 mm.